The Jumanji board game is a game based on the Jumanji movie starting Robin Williams. The board is created to resemble the board used in the actual movie, but not the events started by landing on certain squares. The Jumanji board game was released in 1995. 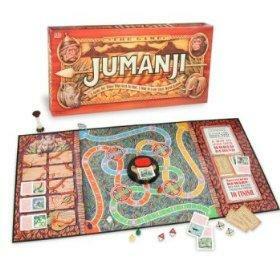 The Jumanji board game board. A deck of danger cards. A red filter disc to read the cards, which have a special section on how to save yourself. The game was published by Milton Bradley. The Jumanji board game can be played with two to four players, and there no benefit to play with any amount of players. An average game takes about 45 minutes. The first few games you play may take an hour or more while you get use to the rules. It is recommended that ages eight and up play the game, but younger players can play the game, provided an adult helps them read some of the cards. Much like the movie, you get pursued by lions, rhinos and other animals as you go on an adventure with other players. After choosing your pawn, you receive one rescue die. All the players set their pawns at the starting position. As you move around the board, blank spaces mean you draw an adventure card. You use the decoder to let everyone know what item will release the "trap" your in. The timer is flipped, and the other players have eight seconds to roll their rescue die and come up with the item that will rescue you. All the players must roll the rescue item, otherwise you-as the trapped player-must move back the number of space on the card. If the players all roll the item needed to rescue you, then those players get to move ahead the number of spaces indicated on the card. If you land on a space with a rhino, then you get to place the rhino in front of any player on the board. To get the rhino out of the way, whether you are blocked or the players are, an even number must be rolled on the movement die. If an odd number is rolled, then the rhino stays, or moves with the player if he or she is forced backwards. Now, for spaces that say "wait for 5 or 8", then you pass the movement die to your left, and that player rolls it once. If it rolls a "5 or 8", then you turn ends. Otherwise, the die continues to be passed and rolled until a 5 or 8 is rolled, with you moving back one space for each failure. Spaces with circle means you have entered the jungle and all the players are subject to the next card's animal and rescue item. Every player must roll the item in order to move on. If not, everyone moves back one space each time the 8-second timer gets exhausted. On the left side of the board is a special section called "The Doomsday Grid". Up to 10 adventure cards are held here for each rescue attempt that fails. When all 10 spaces are filled, then the game is over and a new game must start. To win, a player's pawn must reach the center of the board on an exact role before the Doomsday grid is completely filled. The game is considered won if the grid is filled and another game must begin. If you are interested in purchasing this game, it is available at most online retailers like Amazon or auction sites like eBay. Soon, you could have rhinos or lions chasing your through the jungle!